Christmas Cards Made Out of Microscope Slides Composed of Shells #ArtTuesday « Adafruit Industries – Makers, hackers, artists, designers and engineers! Science meets art in these unique but fascinating Christmas cards. While mostly they concentrated on exploring the diverse forms of these fossils, as each December approached, they devoted time to more whimsical slide arrangements. 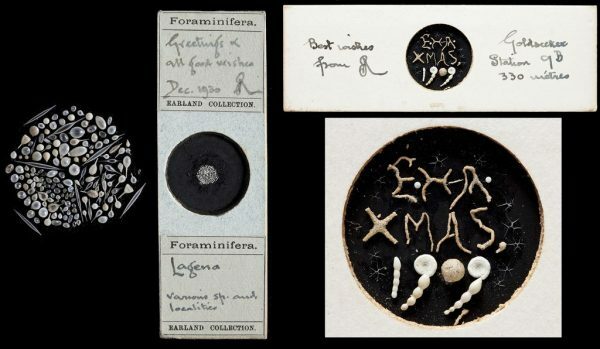 These Christmas-themed slides, which the two exchanged over their years of collaboration, had personalized greetings spelled out with microfossils (a term for fossils measuring under 1mm in size) that would be visible under a microscope. One from 1912 has Earland’s initials (“AE”), “XMAS,” and the year in an arrangement that measures about 1cm across. Several examples of their Christmas slides are now in the collections of NHM. The 1912 slide is a part of the museum’s touring exhibition Treasures of the Natural World alongside birds studied by Charles Darwin and an Iguanodon bone described by Richard Owen. More humble than these illustrious objects, the slide is still an incredible work of art and science, with each small fossilized shell carefully selected and delicately attached to the slide using a fine paint brush and Tragacanth gum.